Kharkiv is leading the fight across various Ukrainian towns and cities against the pressed hard deadline to meet a November 21 deadline for identifying streets, squares, enterprises, and other places that fall under a sweeping "decommunization" law that came into force in May 2015. Local communities were also submitting suggestions for new names to replace literally thousands of ubiquitous toponyms like Lenin Avenue or Dzerzhinsky Square. In addition, they were tasked with identifying monuments and artworks that are suffused with Soviet symbols and ideology that should be dismantled under the legislation. Over the last six months, the country has passed through a process of public hearings and open debate that has revealed deep divisions over how to deal with the lingering legacy of more than 70 years of communist rule from Moscow. In some cases, especially in the southern and eastern parts of the country where significant parts of the population identify with Russia, the local authorities have been less than enthusiastic in implementing the new law. "I think that in general our politicians have acted rather irresponsibly," said Volodymyr Viatrovych, director of the Ukrainian Institute of National Memory. "Many in their electorate, especially in local elections, are people of the older generation, and instead of reporting to them the demands of the law and the necessity of implementing it, they have been playing on their sentiments. They tell them it isn't necessary and somehow they can resolve the issue and that they are against renaming and that, if elected, they will do what the voters say. Acting in this way is a direct violation of the law." "It went exactly as expected," wrote local writer Serhiy Petrov on Facebook following a November 11 meeting at Kharkiv’s Kyiv district administration building. "A whole roomful of budget-sector workers was herded in -- primarily teachers (for example, I saw several teachers and the director from the school I went to). It was the typical exercise of administrative resources, using teachers like slaves." "We read about the public hearing in the newspaper," a nurse who identified herself as Olha told RFE/RL. "We work in Municipal Maternity Hospital No. 3. Why are you provoking us? We came here on our own." Olha prevented the other women in her group from speaking with journalists. "We looked at 263 streets, which is many more than the official commission," said group activist Maria Takhtouloviy, who at one point was reduced to shouting from the back of the hall. "Every name [we suggested] was well grounded -- either a return to an old name or a new one that is based on local geography or a specific local object or figure. This is work of a completely different category than what was proposed by the city authorities." Two other attempts to hold public hearings on the issue were cancelled when they threatened to turn into riots. In one case, a group of unidentified young men took over the podium and began a tussle. Kharkiv Deputy Mayor Ihor Terekhov took the microphone and said: "Considering the situation, it appears it has become dangerous for all those in the hall. We are closing the public hearings. Further actions will be taken according to the law." "As far as what you call the ambiguous context of these names, let's talk about the law and how we are fulfilling the letter of the law," Deputy Mayor Terekhov told RFE/RL. "There are people who deserve to be memorialized. 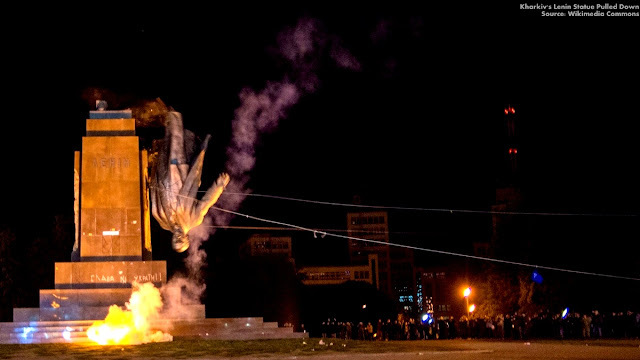 Whether we like it or not, the people of Kharkiv do not support renaming. And we will do whatever we can not to let them down." A July poll by a Kharkiv institute found that a majority of city residents oppose the renaming. Likewise, a majority oppose naming city locations after the Heavenly Hundred, as the Ukrainian government refers to the victims of police violence during the 2013-14 Euromaidan uprising against then-President Viktor Yanukovych. He fled to Russia in February 2014 and was replaced by a pro-Western government, whose ties with Moscow have been further strained by its takeover of the Crimea region and its military support for separatists who control parts of two provinces south of Kharkiv. The Ukrainian government in Kyiv has until February 21 to respond to the local lists, setting up a likely collision between the central authorities and the administration of Kharkiv Governor Hennadiy Kernes.